What percentage of your major gift donors make only one gift, then stop giving? Click your answer below to see the results! OK. Sometimes they end up being one-night stands, but we shouldn’t be out there looking for them. One-night stands are exciting. A well-meaning volunteer sets you up. The prospect meets with you as a favor to your volunteer. Maybe arm-twisting or favor trading is involved. You’re eager so you do your homework. You put on your sharpest outfit. You come to the meeting ready to make your best effort. In the back of your mind you know the first time is also probably the last. You get the adrenaline rush. You ask for the gift. If you get it, what a thrill! And then the thrill is over. Time to find another prospect to give you that rush again. Eventually the pickings get slim. And it turns out you’ve spent a lot of time having one-night stands and none of those donors has developed a lasting relationship with your organization. It doesn’t sound like a formula for success, and it’s not. At the end of the day, no meeting is primarily about the gift. Every meeting has to be about building a relationship, because virtually no gift is worthwhile in isolation. 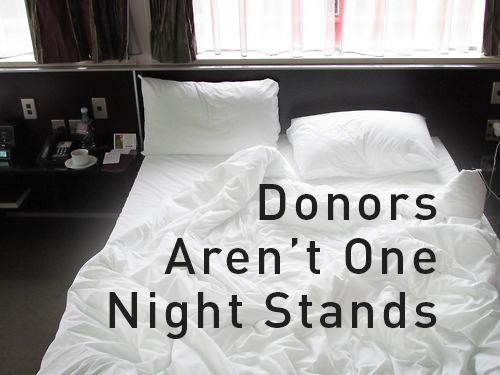 Individual donors are best because they don’t like one-night stands any more than you do. The one-off gifts individuals make are rarely as satisfying as those they make to organizations they have come to know and admire. And once they have formed a relationship, they want to build on it just as you do. Your job is to value the relationship and think of ways to deepen it. How can you best do that? So the next time someone wants to set you up on a one-night stand, tell them it’s not worth your time and ask them to find someone with whom your organization can have a long, meaningful relationship!